Microsoft patched two zero days in December 2018, one within Windows and one for Internet Explorer. The first major flaw in Kuberenetes was both identified, and subsequently exploited. The SplitSectre vulnerability was identified affecting AMD processors, with potential for similar consequences to the Spectre flaw identified in 2017. There were two significant stories in December about router vulnerabilities. One affecting Huawei routers being vulnerable to credential leaking ( CVE-2018-7900), and a new exploit being available for a new Mirai variant ( ThinkPHP 5.0.23/5.1.31 - Remote Code Execution). Microsoft patched 40 vulnerabilities in their December security updates, notably CVE-2018-8611which was reported as being exploited by at least two different APT groups ( Intrusion Set: FruityArmorand Intrusion Set: SandCat). The report Security Researcher Discloses New Windows Zero-Day on Twitter identified a security researcher who has previously posted Windows Zero-Day vulnerabilities and PoC code on Twitter. This issue resided within the MsiAdvertiseProduct feature of Windows, and could allow an attacker arbitrary to read files that would otherwise only be available to a system administrator. The report Satan Ransomware Variant Exploits 10 Server-Side Flaws covers 10 different vulnerabilities affecting both Windows and Linux that could allow ransomware to be installed and spread in a worm-like propagation method. This month the report Demystifying Kubernetes CVE-2018-1002105 (and a dead simple exploit) was published that demonstrated how CVE-2018-1002105, the first major flaw identified in Kubernetes could be exploited. The report Hacking Group Outlaw Distributes Botnet for Cryptocurrency-Mining, Scanning, and Brute-Force covered an old vulnerability ( CVE-2013-4788) that was being actively exploited for crypto-mining purposes. December also saw the above mentioned Mirai variant targeting the ThinkPHP framework ( IoT Botnet Delivered via ThinkPHP Remote Code Execution Exploit). The report WebKit Vulnerability Affects Latest Versions of Apple Safari was published that discussed a Webkit regex error that could be exploited by malicious attackers, and affected both macOS and iOS versions of Safari. For Android devices, in December the report Google Patches More Than 50 Android Vulnerabilities in December covered a host of new flaws, including six critical bugs in the mobile OS, mostly affecting the Android Media Framework. The report New Threat Actor SandCat Exploited Recently Patched CVE-2018-8611 0Day, which identified a major bug affecting Microsoft's Internet Explorer which was patched in an out-of-band security update, thus was the severity of the flaw ( Zero-Day Bug Fixed by Microsoft in December Patch Tuesday). The report Underminer Exploit Kit Improves in Its Latest Iteration also identified updates to the Underminer exploit kit which targets Flash and Internet Explorer vulnerabilities to infect its victims. A PoC for CVE-2018-8629was published in December ( Demo Exploit Code Published for Remote Code Execution via Microsoft Edge), this vulnerability was fixed by Microsoft in the December security updates, however the code for this exploit was made available on GitHub shortly after. Three vulnerabilities were patched for phpMyAdmin in December ( CVE-2018-19968, CVE-2018-19969and CVE-2018-19970), the report phpMyAdmin Releases Critical Software Update contains more detail. The report SplitSpectre: New Spectre-like CPU Attack discussed a new vulnerability that can affect CPUs in a similar manner to the Spectre vulnerability first identified in 2017. The flaw does not yet have a CVE identified. Guardzilla IoT Video Camera Hard-Coded Credentials (CVE-2018-5560)disclosed how moderately-skilled attackers could access Amazon s3 credentials contained within the firmware Guardzilla IoT Video Cameras. The above Attack Patterns are sometimes related to tactics by threat actors, but also are sometimes observed as behaviors not always linked to a certain adversary. Some of these may come from updated or new Metasploit modules, or they may stem from research into APT groups and their most recent TTPs. 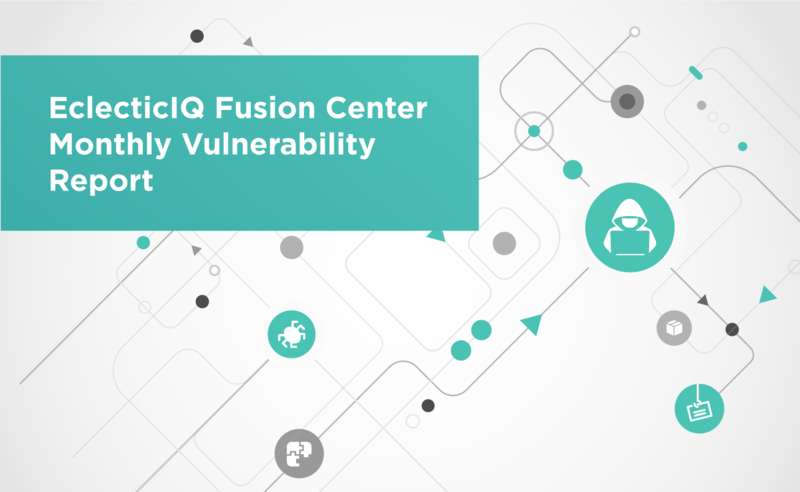 EclecticIQ Fusion Center recommends organizations to apply security updates to their systems as soon as they become available, in order to mitigate against the risks posed by the vulnerabilities mentioned in this report. It is worth noting this report is a summary of the main vulnerabilities we have seen over the course of a month and as such is not reflective of the full list of CVE information published by vendors.